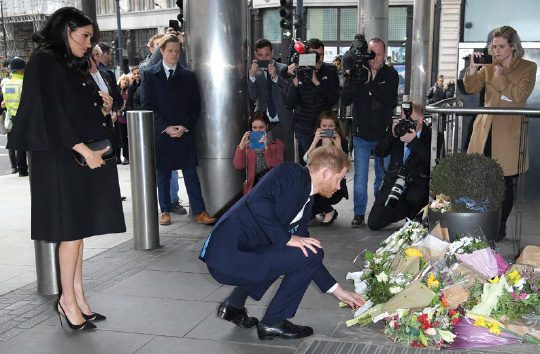 The Duke And Duchess Of Sussex Sign A Book Of Condolence At New Zealand House: Prince Harry and Meghan, the Duke and Duchess of Sussex, arrive at New Zealand House to sign the book of condolence after the recent terror attack which saw at least 50 people killed at a Mosque in Christchurch on March 19, 2019 in London, England. Prince Harry, Duke of Sussex, arrives to take part in a tree planting project in support of The Queen's Commonwealth Canopy (QCC) initiative, together with the Woodland Trust at St. Vincent's Catholic Primary School on March 20, 2019. 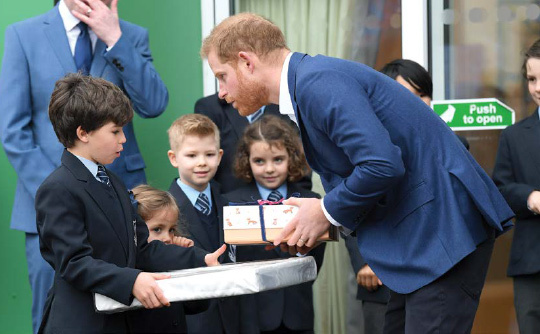 Contents of the gift box the students gave to Prince Harry. 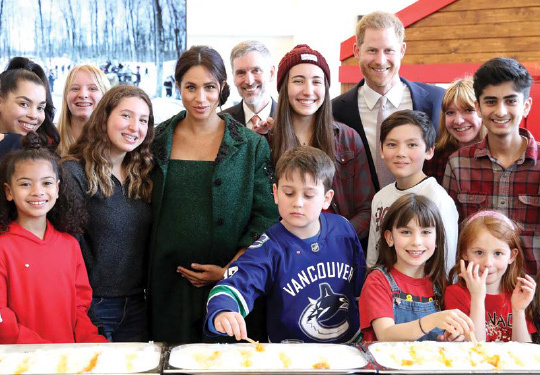 Prince Harry and Meghan, Duke and Duchess of Sussex, pose with young people who demonstrated a Canadian spring tradition of making maple taffy (maple syrup cooled on snow to make sweets) during a Commonwealth Day Youth Event at Canada House on March 11, 2019 in London. The event showcased and celebrated the diverse community of young Canadians living in London and around the U.K.
Princess Eugenie of York meets patient Maggie Hawkes, 12, during a visit to the Royal National Orthopaedic Hospital to open the new Stanmore Building. 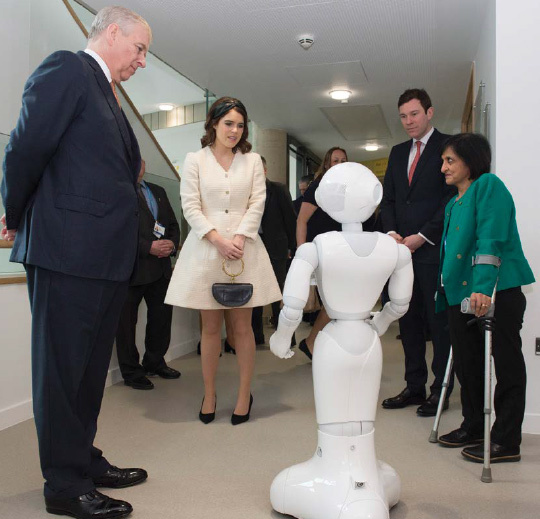 The Duke of York Visits The Royal National Orthopaedic Hospital: (L-R) Prince Andrew, Duke of York; Princess Eugenie of York; Jack Brooksbank; and Dr. Saroj Patel meet a robot called Pepper, during a visit to the Royal National Orthopaedic Hospital to open the new Stanmore Building on March 21, 2019 in Stanmore, Greater London. 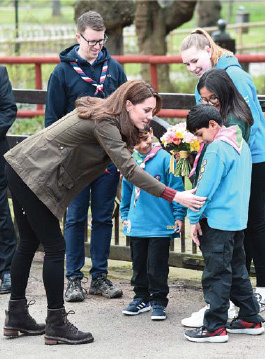 The Duchess Of Cambridge visits The Scout's Early Years Pilot at Gilwell Park in Epping, England. Catherine, Duchess of Cambridge, meets children while she visits the Henry Fawcett Children's Centre in London to learn more about the work being done by local organizations in Lambeth and to support young children and their families, March 12, 2019. 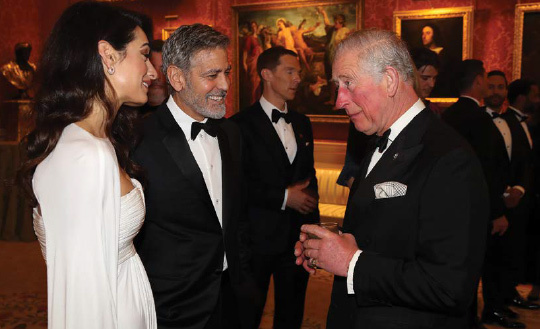 The Prince Of Wales Hosts Dinner To Celebrate 'The Prince's Trust' on March 12, 2019: Amal and George Clooney speak to Prince Charles as they attend a dinner to celebrate ‘The Prince's Trust’ at Buckingham Palace in London, England. The Prince of Wales, President, The Prince’s Trust Group hosted a dinner for donors, supporters and ambassadors of Prince’s Trust International. The Prince Of Wales hosts a dinner to celebrate 'The Prince's Trust' on March 12, 2019: (L-R) Actor and director Chiwetel Ejiofor, actor Luke Evans, actress Tamsin Egerton, actor Josh Hartnett, actor Benedict Cumberbatch, Amal and George Clooney attend a dinner to celebrate ‘The Prince's Trust’ at Buckingham Palace in London, England. The Prince of Wales, President, The Prince’s Trust Group hosted a dinner for donors, supporters and ambassadors of Prince’s Trust International.